During my week with the A5 there was no doubt as to its most compelling attribute, the styling. My test car was blue — specifically, Aruba Blue Metallic — which is not a normal test-car color. It was gorgeous. The other A5s I've seen around Chicago have been the same shade of dark gray. While that's a handsome color, it sure screams "blah" compared to a striking color like this. Really, though, any color works on the A5 because it has a swoopy profile, a bold front end highlighted by the trademark Audi grille, and a dynamic rear with trapezoidal LED taillights. 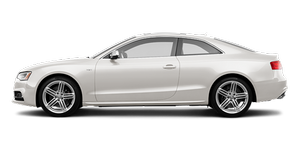 It rides low and features standard 18-inch wheels, all of which lead to a cohesive design that you can tell Audi put a lot of thought into. The BMW 3 Series two-door looks like a design afterthought, and it's not as elegant as the A5. The G37 looks generic in comparison. The A5 stands out and, yes, many folks turned their heads when I drove through downtown Chicago during my commute. One interesting feature is the A5's standard glass roof. It doesn't slide open like a moonroof, but it does crack open to let air in. It makes more of an impact inside than out, though the black roof does help break up the A5's exterior color scheme.